Web-Tastic is pleased to anounce the launch of a new site for Heronwood Bed and Breakfast http://www.heronwood-bed-and-breakfast.co.uk . 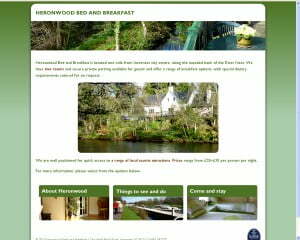 “Heronwood Bed and Breakfast is located one mile from Inverness city centre, along the wooded bank of the River Ness. We have two rooms and secure private parking available for guests and offer a range of breakfast options, with special dietary requirements catered for on request. Web-Tastic was able to quickly set up a hosting account so that AWDesign could quickly upload the site that they had designed.